To mark John F. Kennedy's centennial, celebrate the life and legacy of the 35th President of the United States. In 1964, Jacqueline Kennedy recorded seven historic interviews about her life with John F. Kennedy. Now, for the first time, they can be read in this deluxe, illustrated eBook. Shortly after President John F. Kennedy's assassination, with a nation deep in mourning and the world looking on in stunned disbelief, Jacqueline Kennedy found the strength to set aside her own personal grief for the sake of posterity and begin the task of documenting and preserving her husband's legacy. In January of 1964, she and Robert F. Kennedy approved a planned oral-history project that would capture their first-hand accounts of the late President as well as the recollections of those closest to him throughout his extraordinary political career. 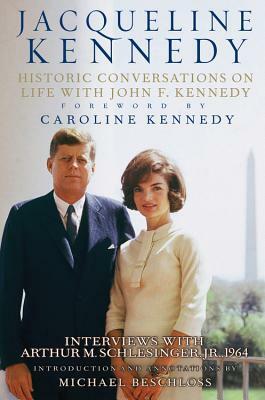 For the rest of her life, the famously private Jacqueline Kennedy steadfastly refused to discuss her memories of those years, but beginning that March, she fulfilled her obligation to future generations of Americans by sitting down with historian Arthur Schlesinger, Jr., and recording an astonishingly detailed and unvarnished account of her experiences and impressions as the wife and confidante of John F. Kennedy. The tapes of those sessions were then sealed and later deposited in the John F. Kennedy Presidential Library and Museum upon its completion, in accordance with Mrs. Kennedy's wishes. The resulting eight and a half hours of material comprises a unique and compelling record of a tumultuous era, providing fresh insights on the many significant people and events that shaped JFK's presidency but also shedding new light on the man behind the momentous decisions. Here are JFK's unscripted opinions on a host of revealing subjects, including his thoughts and feelings about his brothers Robert and Ted, and his take on world leaders past and present, giving us perhaps the most informed, genuine, and immediate portrait of John Fitzgerald Kennedy we shall ever have. Mrs. Kennedy's urbane perspective, her candor, and her flashes of wit also give us our clearest glimpse into the active mind of a remarkable First Lady. In conjunction with the fiftieth anniversary of President Kennedy's Inauguration, Caroline Kennedy and the Kennedy family are now releasing these beautifully restored recordings on CDs with accompanying transcripts. Introduced and annotated by renowned presidential historian Michael Beschloss, these interviews will add an exciting new dimension to our understanding and appreciation of President Kennedy and his time and make the past come alive through the words and voice of an eloquent eyewitness to history. Very educational, open look at what was going on during that time in our American history. Too bad the quality of the recording (probably due to 1964 technology) is so poor. I did find the amount of air traffic to be quite a bit surprising. I love the sound of her voice.